This sign up is for people or groups to adopt a section of the DTE Trail System by volunteering time to help maintain the trail experience! The Adopters responsibility is to help maintain the trail with clearing overgrowth via trimming and other means. Tools are provided and located close to the trail off of Waterloo rd. Adopters can sign out the tools required and check them back in. We are looking for calendar year commitments or longer of course! And we are working on some swag for the adopters. In general expect to put in time a few times a year, primarily in the early summer after the spring growth and leaf out. More details will be provided for those interested and do not be shy, please step up and we can help if you are new as well. 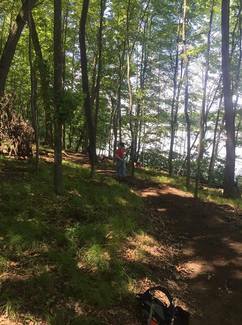 We need your help to keep the trail in great shape. Did you know that the trail is entirely built and maintained by the Potawatomi Mountain Biking Association (PMBA) and NOT the MDNR? The PMBA is composed entirely of volunteers - trail users who have day jobs, but still manage to find time to make great trails like DTE happen. With this in mind, we need an ever-expanding volunteer base to keep things going and conduct routine trail maintenance. Routine maintenance consists primarily of lopping branches of mostly unwanted invasive forms of flora which encroach on the trail corridor. These "droopers" narrow the corridor, slap users in the face, and limit sight lines. Other routine maintenance consists of weed whipping and light scraping of debris out of trail "drainage basins". Each segment is in 1 mile sections starting clockwise utilizing the mile markers. Log any and all volunteer hours for DTE and the Poto Chapter Trails with the link provided below. Clockwise, person or group needed. Arbor Move Team reporting for duty!